We are committed to providing the highest quality fruit to our customers and our community. With our highly dedicated staff and sophisticated management of our environment, fertilizer/ pesticide use and pest control system, we have provided best tasting fruit with minuscule residues that are well below Canadian health standard. Please see our latest testimony of 2016 and 2017 test report. We acknowledge the advantage of low spray integrated pest management system (IPM). Meticulous, weekly examinations of insects are carried out by scouts. 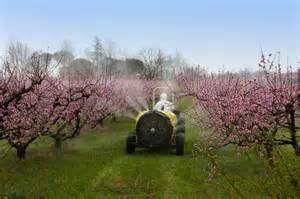 By trying to establish a balance between predatory and damaging insects, insecticide sprays have been kept to a minimum, which in the past has produced fruit which is free from residues expressed in parts per 100 million. Our well monitored IPM approach requires less spraying per pound of fruit produced, and reduces our spraying to only when it's absolutely necessary to protect our crop. Our 2016 test report is a great testimony of our integrated pest management system success.